Access to the award-winning and evidenced-based Low Carb Program through the NHS is set to increase in 2019 thanks to a new partnership with Ascensia Diabetes Care. Ascensia’s team will be visiting, and providing support to, GP surgeries across the country to implement the digital behaviour-change platform for people with type 2 diabetes, prediabetes and obesity, which has over 380,000 users and pioneering and peer-reviewed outcomes. Developed by Diabetes Digital Media (DDM) and launched on World Diabetes Day 2015, the Low Carb Program’s one-year outcomes were published last summer demonstrating the average member with type 2 diabetes loses 7.4kg and reduces their HbA1c by 1.2%, with 39% of people placing their HbA1c under the threshold for type 2 diabetes diagnosis. Additionally, 40% of participants eliminate at least one drug from their treatment regime and one in four people place their type 2 diabetes into remission. Based on the study, the estimated projected saving to the NHS is £835 per patient, per year in medication de-prescription alone. The partnership between DDM and Ascensia will enable more people across the UK to sign-up for the Low Carb Program by encouraging GPs to make it available on the NHS. Ascensia Diabetes Care will support NHS healthcare professionals who play a role in managing people with pre-diabetes, type 2 diabetes and obesity to implement the platform at their surgeries, enabling them to offer the program to their patients on the NHS. Ascensia Diabetes Care have over 70 years proven history and experience working with the NHS to provide high-quality, blood glucose monitoring devices. With a diabetes epidemic on the horizon and only a 7.4% uptake of educational programs, there is a clear need to provide cost effective diabetes management and prevention solutions, and the Low Carb Program delivered by Ascensia addresses this gap. The Low Carb Program, which was developed in collaboration with Southport GP and low carb advocate Dr David Unwin, is available on mobile devices (iOS and Android). It educates on how they can reduce their carbohydrate intake, offers recipes and meal plans, encourages people to track their health data, and can be connected to fitness trackers and a number of Bluetooth-enabled devices. People can stay up to date with new lifestyle articles added daily and be supported with a peer-support network of hundreds of thousands of people, including Mark who lost 50kg and put his type 2 diabetes into remission, Stella who lost 35kg and placed her prediabetes into remission and Sarah, who reduced her medication dependency by 75%. 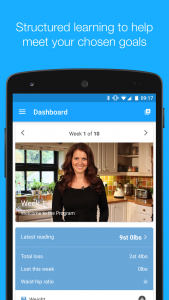 Totally customisable and personalised to demographics, disease profile and dietary preferences, the Low Carb Program tracks blood glucose levels, weight, sleep, and has a food diary, empowering people to control their metabolic health through a lower carbohydrate approach. It is approved by QISMET for delivery as structured education within the NHS and is certified as a MHRA Grade I Medical Device, complete with a CE Mark in compliance with EU regulations. 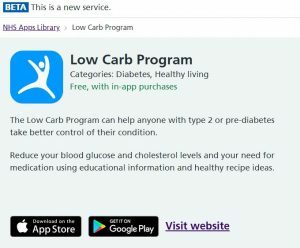 Meanwhile, the Low Carb Program has also recently undergone the rigorous NHS app approval process and on December 24 last year was accepted into the NHS Apps Library, helping people make better choices about the digital health and care tools they use. For more information about the Low Carb Program, click here.